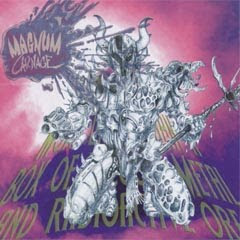 Magnum Carnage's More Unreal Than a Box of Precious Metal and Radioactive Ore calls into question the point of reviewing records. So mired in both underproduction and over-ambition is the album that my written opinion is based less on my impression of its value, and more on whether I have the patience to deal with it at the moment I permanently inscribe my thoughts about it in the digital firmament of the interhole. I recoiled in horror the first few times I heard More Unreal, and it still makes me sort of uncomfortable now. But like a lovable puppy that keeps shitting all over your nice throw rug and then licks your face and looks at you with gigantic puppy eyes, I can't possibly hate something this adorable. On a good day, More Unreal itself is easily resistable. Magnum Carnage's charm is not, and at this point (might change as soon as I hit "publish"), I kind of admire its oddness as a supreme middle finger to black metal uptightness. Kind of. Could this band come from anywhere other than Hawaii? "Divine Comedy Pt. 1 - Damn This Age!" Self-described as "psychedelic black metal," More Unreal is only psychedelic in that it sounds like a moldy artifact unearthed from lone member Kai Laigo's attic (helping that impression: it came to me in the same package as a cassette tape, a waaaaay DIY live DVD and some Hawaiian candy. Just add in a couple dead cockroaches and it feels like moving day!). And it's only black metal to the extent that Laigo's got some fast guitars and a bit of rasping buried underneath his caveman drum programming, which turns tom rolls into the sped-up click of a broken record, blastbeats into the clinking of glasses before a wedding toast. Laigo proudly claims that he recorded More Unreal using a dinosaur version of Pro Tools LE. But even dinosaurs stomp; the album's cluttered mixes and sunken guitars just drag, where Laigo's colorful palette demands bigness and clarity. As easy as it is to dismiss More Unreal for its extreme sonic shortcomings, you gotta admire the cojones of a guy brazen enough to let the gated drums and cheesy synths of 80s pop within ten miles of a death metal riff, or to call one of his songs "Video Games of the Gods," and have it sorta work in an early-Emperor-still-figuring-out-their-gear kind of way. There's no shortage of imagination on More Unreal, no end to the shred-worthiness of Laigo's manic guitar solos. Occasionally a pop hook rises out of the mixing murk and connects big-time ("Demon City Honolulu"). But then Laigo will awkwardly pair a doom metal riff with doo-wop backing vox ("Suitcase Nuke"), and back to the murk we go. Every great riff is offset by an eyebrow-raising production quirk (seriously Kai, AUTOTUNE?!?!) or forced structural aside. Wrapped in the dayglo pinks and purples of a Lisa Frank sticker set, More Unreal demands to be taken on its own silly terms. Yes, it's a near-failure as a metal record. More metal records should fail in such spectacular fashion. I don't think this is half bad. It's actually pretty interesting.